A few points about omega fatty acids. Most people are getting too many omega-6 fatty acids in their foods so therefore I recommend eliminating all omega-6 fatty acids. The minimum starting dose is for reversal of underlying developmental delay is around 600 mg of EPA+DHA, and I prefer starting at a higher dose if possible. The oleic acid is important but that is why I have people cook their child’s food in California olive oil. Hello, my 3 year old son seems to be FODMAP sensitive (so no onion, garlic etc). Can he still take Inulin? FODMAP sensitivity is evidence of bacterial overgrowth, and inulin helps reverse bacterial overgrowth. I know you like to see less swimming with the protocol, in one of our groups several mothers are experiencing higher stimming in their children with the regimen. What do you think is causing this? How far into protocol would you be concerned if there was still an increase in excitatory behavior like stemming with the protocol? It hard to answer because I’ve found that most of what was called “stemming” was actually just a more awake, energetic child that with a little more time continued to improve. Remember, all autistic children have underlying developmental delay, and when the toxic effects of propionic acid lift, this will become more apparent. Given more time, the developmental delay will also begin to recover. Please re-read my article about the phases of recovery. That being said, anytime any patient experiences an adverse, unexpected side effect from any treatment (natural or pharmaceutical), they should stop it. My daughter has a shellfish and seafood allergy. She was taking the Inulin and Omega gummies for 2 weeks without any reaction. Then, she got a concussion and picked up a virus, had a high temperature for 5 days and developed a rash around her mouth, back and stomach. I gave Benadryl and stopped the Nordic Omega gummies and the rash went away. I really want to get her back on your protocol after she recovers from this virus. Should I do it even if I have to use Benadryl too? Hi Doc, you say that it takes a few weeks till the gut is stabilized. So Can we use an alkali till then? In regards to autism, I cannot see where an alkylating agent would be useful. One of the main purposes of inulin is to help acidify the upper small intestine. Could you recommend dosing for a 9 year old, 50lbs? Our son also has a confirmed Lyme diagnosis in addition to ASD. would this necessitate starting right off with the antibiotic? He has been treated for the Lyme for over s year using the Weigman Protocol. Our physician has received your article and is very interested. Are you willing to do a telephone consult with her, as we are located in Canada. The general guidelines required for your doctor to start the Nemechek Protocol in your child are present in the Update already and consultation is not required. But I would like to ask you about the dosage of Omega- 3, 690 mg .
Children having pain should always be evaluated by a doctor. Can inflammation be present only in abdominal region or at stomach region too. If yes does inulin repair stomach lining too? Thank you! Inflammation can occur anywhere along the intestinal tract but the inflammatory response associated with bacterial overgrowth is due to the leakage of bacterial cell membrane components into the immune tissue that surrounds the small intestine, not swelling and redness of the lining of the small intestine itself. If there is no identifiable congenital disorder in regards to the rib cage anomaly, I can’t image any bone structure (long rib cage, scoliosis, etc) negatively affecting any organ development including the intestinal track. 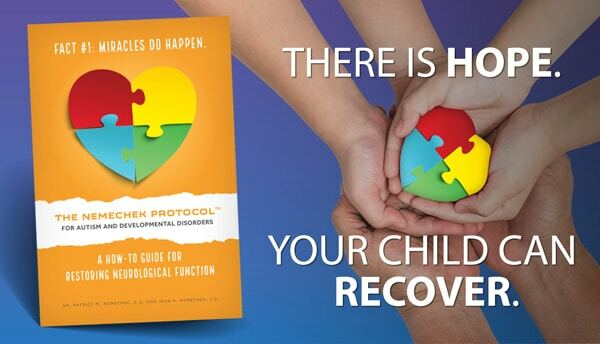 My protocol helps a wide range of developmental issues. Inulin can be taken with or without food and can be mixed with hot or cold solids or liquids. The gut goes through some adjustments for a week or 2 when starting the inulin fiber, and most of the little issues straighten themselves out. The Vitamin Shoppe fiber looks like it is pure inulin. Please see my prior comments about recovery times. And do not use any 3-6-9 omega combinations. The excessive amount of dietary omega-6 fatty acids are a part of the problem with inflammation. She has actually recovered p hysically with therapies and weighs at par to her age Except that the abdominal muscles are slightly weak that doesn’t allow her to climb up independently. Cognition has improved but minimal. No eye contact N speech at current age of 6. In a way tough to conclude if it is autism or development delay or cognition loss during the tough episode that she had. Do you think that the damage done during infant stage is permanent? But her MRI N other reports are normal. If MRI is normal and no serious genetic defects such as Down’s Syndrome, I believe the brain still has the capacity to recover. Just another concern – my kid had metabolic acidosis and severe dehydration as a baby. That’s when she had fluid loss and development hampered. Till then she was all fine socially, emotionally, developmentally. Till date the effect of that episode has not subsided…Even now abdominal muscles seem weaker apart from digestive and nervous weakness. Will this protocol suffice to reinitialize her development or more needs to be done. It’s uncertain but I would be hopeful. Ok thanks for that detailed response. So doctor, do you also suggest high water intake since inulin seems to be high fiber food? I see many comments on cramping , so just warning myself. We live in a tropical country where the temperatures are quite high which demands more water intake. We live in another state and would have to fly to Arizona. Do you ever see patients solely by Skype? My son is 91/2 and Autistic. No, initial Skype visits are educational but I am prevented by state licensing and insurance regulations from offering specific diagnostic or treatment recommendations. The best thing to do it fly to AZ for your initial appointment, and then after the first face-to-face we can perform follow-ups via Skype. My kid is on ASD, has too weak digestive issues. For example, I soak Chia seeds and give her. She has stomach bloating and cramps. I tried giving her biscuits, cookies etc. She gets cramps easily while all her peers eat and digest almost everything easily. Does this weak digestive system come under autonomic dysfunction? Do you think this will get resolved with inulin? We’ve started a few days ago and it seems my son is sleeping better, but also more tired than usual. Is that a common side effect? Does it go away? Thanks! The intestinal bacteria can communicate to the brain through 5 or 6 different pathways. In kids with autism, I like seeing signs that they are calming down more (better sleep, less anxiety, less stemming) and more in touch with their surrounds (improved eye-to-eye contact, recognizing the arrival of a familiar person). These are signs to me that the propionic acid levels are dropping. Patients can feel a variety of minor effects and bacterial balance is restored with either inulin or Rifaximin. Their symptoms and developmental issues seems to slowly improve over the ensuing weeks and months. Wow fantastic. Yes I strongly discourage probiotics. They may dampen some intestinal symptoms but do not resolve the bacterial overgrowth enough to make a difference. More importantly, they have the potential to worsen neurological functioning. I understand kids might seem a little better on probiotics is some respects but its very limited in most cases I’ve seen. Keep up the good work and remember recovery from developmental delay is slow like hair growth, you can’t speed it up but before you know it you need a haircut! If inulin is all that is readily available, I’d start with that. As a rule, the older the kids get, the better they do with rifaximin rather than inulin but I’ve seen do wonders for teenagers. I recently read about your protocol and am considering it for my son (6 yrs old Non verbal ASD with very few other noticeable issues). I have read some people mentioning about constipation, bloating etc from the Inulin and Omega 3. at the moment my son has no apparent diet or bowel issues. He urinates and defecates regularly with no issue. I am worried that in trying to help him with his speech that i may create a different problem. From the child’s perspective, I think he would rather be able to talk and have constipation than the opposite. Ignore they hype about yeast, I personally think it is great overblown. Most of issues they attribute to yeast are actually from bacterial overgrowth. If you would like to search for the science yourself, at “pubmed” to search terms and this will primarily restrict you to peer-reviewed research articles. I suggest you ask your genetics consultant. The Nemechek Protocol is inexpensive, readily available for most and has the potential to help a lot of children. The Nemechek Protocol was specifically designed to reduce levels of pro-inflammatory cytokines within the brain as well as throughout the body. If lowered enough, inflammatory disorders greatly improve and repair mechanisms are activated leading to improvement in neurological functioning of not only the autonomic nervous system but all other aspects of the brain as well. Because of the broad neurological benefit, improvement can be seen in a variety of ways. How are vegans able to get enough DHA (since most DHA comes from animal meats) for proper neurological function is an unsolved question yet. It’s looking like the high ALA (an omega-3 in nuts and flax for instance) diets boost the small amounts of DHA into the brain. This issue is still being worked out. “The increase in acidity of the small intestine suppresses the overgrowth of propionic-producing bacteria and results in the resolution of the toxic encephalopathy”. Because of the broad neurological benefit, developmental delay and the attention issues from cumulative brain injury both are things that a commonly see improve. Thank you for sharing this information. Do you think this protocol would help with other autoimmune conditions? In it’s full force, the Nemechek Protocol for autonomic Recovery can greatly help adults with autoimmune disorders. I have patients with rheumatoid arthritis, ankylosing spondylitis, Hashimoto’s, Crohn’s, psoriasis, and multiple sclerosis whose symptoms have greatly improved. I have not treated any children as of yet with autoimmune disorders but I don’t see why it wouldn’t help them as well. We are beginning to understand that the autonomic nervous system must be damaged in order for most autoimmune disorders to be activated. The damage is to the vagus inflammatory reflex. Read my recent post on autoimmune disorders. Bacterial overgrowth and intestinal dysbiosis alter the blend of bacterial within the mouth and throat as well. I routinely use inulin fiber in children to halt the pattern of recurrent oropharyngeal strept infections. I personally think that what is being called PANDAS might just be a different manifestation of dysbiosis or overgrowth. Yes, I don’t think those foods offer enough fiber to get the proper fermentation. Hi Dr, a couple of weeks that I started on this journey and find it quite helpful. My kid is not as restless as before and sustaining eye contact little better. But what bothers me is his tummy aches. With inulin he is unable to urinate freely and with omegas constipated and is miserable just before emptying bowels. Is this expected behavior and how long will it take for his issues to settle down. Many thanks! Excellent. The improved eye contact and calming effect is most likely due to a drop in propionic acid levels. Try stopping one or the other to see which is causing the problem with cramping. If inulin, add a little olive oil as a laxative or something else mild. If fish oil, split the dose or take with food. My kid is on the autism spectrum with intellectual disability too. Does this help bring up his cognition? We are going for genetic examination shortly and worried if that’s going to show up positive. Just want to try this as a last attempt. Plus he has had some neuero degenerative disease at a young age when he was an infant. Don’t let the genetics scare you. It doesn’t mean things are permanent, it just means this gene is present more often in autism. I have a variety of kids with this and that gene that are recovery. 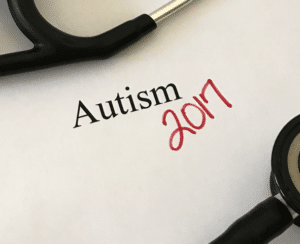 I just posted an addendum to the updated autism 2017 post that talks about recovery and genetics in a broader scope. I think my son should go on the antibiotic but I’m trying to figure out how to get him on one. His pediatrician is far from open minded. I read in your previous comment to someone else that you wouldn’t be able to prescribe anything over Skype. Do you have any suggestions or know any doctors that follow your protocol in the New Jersey area? Thank you! As cumbersome as it may seem, I’ve had several families fly in to Phoenix for a consult and get the Rx. We then do follow-up visits by Skype. Thank you doc. Finally, is there a recommend time for taking inulin supplement for best results? I’m sure there might be some differences for individuals, but I haven’t noticed any. I’m sorry, I’m not familiar with those products. So one should not use give probiotics to child when on this protocol? We currently give our child bcomplex, zinc, buffered c, fish oil, vitamin d and probiotics. Please help me understand. My son is 4.5, high fuctioning autism and non verbal..
Read my recent post on Probiotics and you’ll better understand my concerns. From a practical standpoint, most of the kids who come to me are on probiotics and still are having a great deal of trouble with autism. The probiotics may of helped some indigestion issues but not so much the autism. When I stop the probiotics and add, inulin and omega-3 fatty acids, they start improving at a much faster trajectory. Could you use this protocol and use ACC (Andrew Cutler Chelation). Also does it mean stopping taking probiotics? Doing my protocol alone seems to help. Please see my previous comments on probiotics as well as my recent post on the topic. Hi Dr, my kid brain MRI says Focal cortical dysplasia. He has epilepsy too. Does this protocol help him come out of FCDs? I donot really know how serious is FCD but still want to give this a try. Difficult to say. This will for certain give his brain a fighting chance to repair itself. Oh, I will then surely give this protocol a try. Could you also blog about your kids case and their current health status. That will be a positive inspiration for many, am sure. Hi does this help rett syndrome of autism? My daughters are 8 and 4 resp and they don’t like to use hands. They are also severely developmentally delayed and no hand function and lack of eye contact is affecting their cognition. Please help! It may. I’ve had 2 kids with another severe version of autism, Lennox-Gausaut and it helped both of them tremendously. Yes, we should Skype first. I can fill you in on the medical issues surrounding his health. Only limitations are I cannot by law provide a diagnosis, nor order prescriptions or testing. With that being said, I can give you a lot of insight into what is going on. More info about consultations is available under the About tab. Thanks for the kind words. My wife Jean is the wordsmith. She helps refine my scientific explanation into a more fluid, digestible prose. Eliminating unnecessary supplements often helps a lot of little problems go away.